At Fred Anderson Nissan of Asheville, we know car shopping can be tough; that's why our team is here to make it easy! Our family-oriented staff's main goal is to provide you with exceptional guidance and customer service from start to finish. Remember, anyone can sell you a vehicle, but not everyone can give you peace of mind long after the purchase. 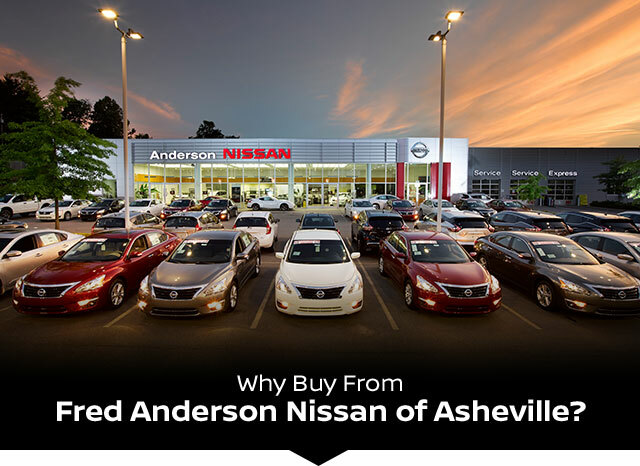 Fred Anderson Nissan of Asheville is more than just a North Carolina car dealership. We believe in supporting & giving back to the communities that have supported us since Fred Anderson opened in 1955. When our customers visit, our goal is to provide quality vehicles, exceptional service and a friendly atmosphere. Our staff has been trained to create ease during your purchase or service experience and we are always making sure you get everything you want and deserve out of your visit. Our vision and mission is an employee-centered and customer-focused environment. We are proud to be a part of and to represent the Nissan brand. It starts with our impressive selection of new Nissans packed with innovative technology, comfort, performance, safety features & style. We will provide a no hassle shopping experience that starts online. We guarantee to find you your next reliable Nissan car, SUV, truck or van to fit any budget. Don't forget, you drive off our lot with lifetime savings through our exclusive Family Plan which is valid on every new Nissan. We also have Asheville's largest selection in the area of quality pre-owned vehicles & certified Nissans. Our pre-owned vehicles start at just $5,999* and every unit is backed with a CarFax Vehicle History report. In addition, our certified technicians perform an in-depth inspection of every vehicle before we place onto our lot. We have every make & model to choose. Plus, when you shop our huge certified selection, you will drive away with a 7-year/100,000 mile powertrain warranty, 24-hour Roadside assistance, Rental car reimbursement and so much more! Don't forget, every Fred Anderson Certified Nissan comes with our exclusive Family Plan! Our Family Plan is also valid on nearly every pre-owned vehicle in-stock! We are always in need of pre-owned vehicles. We will purchase any vehicle, regardless of whether or not you purchase from us! We buy every make & model and refuse to lose a trade deal over price. Our expert appraisal team will pay you top dollar today. When it comes to Nissan service, we have the facilities and the staff to accomplish any task or service need. We offer industry-leading service technicians to perform all maintenance well after the sale! Our team has years of experience, knowledge and top-of-the-line equipment to handle all of your maintenance needs while avoiding any harmful processes to your vehicle. Our goal is to provide you with your immediate service needs but to grow to be your Nissan service dealership for years to come. Our team knows that vehicle maintenance can add up! That's why we offer our complimentary Family Plan with your purchase to assist in service savings for the lifetime of your vehicle. Our Factory trained technicians and professional service department will get your vehicle road ready in no time! With benefits such as a lifetime oil changes and lifetime car washes (to name a few! ), your wallet will be thanking you!